Treasurer Scott Morrison's "taxed and taxed-nots" mantra only adds insult to injury for Australia's ever-increasing "have-nots", writes John Passant. THE one sided class war continues. Only the words have changed. Under Abbott and Hockey it was "lifters and leaners" and "ending the age of entitlement". The "logic" behind this rhetoric gave us the horror Budget of 2014 and its proposed $80 billion in cuts over time to public health and public education. Public opposition to that Budget was widespread and angry. The Abbott Government never recovered and the 18 months of negative polls and the prospect of a Liberal wipe-out at the election, saw Malcolm Turnbull take over and win a bare one seat House of Representatives majority and an unpredictable Senate in the 2016 election. The real #taxednots are the 1 in 3 major corporations paying a tidy $0 tax. And ScoMo wants to give them a $48 bn tax cut. Treasurer Scott Morrison has found some new weasel words to try to disguise the class war he is leading against the poor, pensioners, the sick, the unemployed and low paid workers. After years of denying it, Morrison has admitted we have a revenue problem — although he called it an "earnings" problem. According to Morrison, the great divide in Australian society is between the taxed and the taxed-nots. In ScoMo world it is "the taxed" who have been bearing the burden of budget repair, while "the taxed-nots" have been bludging off us. Time for the taxed-nots to pull up their socks and start contributing to fixing the budget problem. Just who do Morrison and Turnbull have in mind as the taxed-nots? Could it be the 676 big businesses (36% of the group) which, according to the Commissioner of Taxation’s corporate tax transparency report, paid no income tax in 2013-14? Not on your life. Could it be the likes of Don Argus – former Bank of America chairman – and his wife with their tax free pension of $1.2 million a year? No chance. Could it be the 56 millionaires who pay no income tax? No way in the world. Morrison’s prescription for the earnings problem is not to tax big business and the rich but to cut welfare payments to those who most need them — the sort of people he and others claim pay no tax. Analysis from NATSEM, contained in the ACOSS report on inequality, shows that Australia’s tax take (including GST as well as income tax) across various income quintiles fluctuates around 25%, with those on lower incomes as a generalisation a bit below and those with higher incomes a bit above that figure. However, it gets worse when we compare the two ends of the income spectrum. The bottom 5% pay 34.2% of their income in taxes while the top 5% pay 30.1% in tax. In other words, Australia does not have a progressive tax system. Morrison also argued that there were millions on "welfare" who paid no net income tax. By this, he means that the government payments they receive are greater than the tax they pay. Let’s be clear about this. 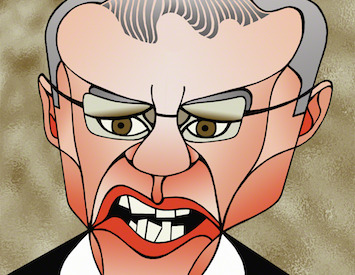 The sort of people Morrison has in mind – and in his sights – are pensioners, the unemployed, students, the disabled, the homeless, those women fleeing domestic violence, the low paid and the list goes on. Among these groups, the main people who pay little tax and receive much more in payments and other benefits from government are pensioners — all 2.4 million of them. Many pensioners have worked for 40 or 50 years and paid upwards of a million dollars in taxes (in today’s money). Many others have looked after the family home and the couple’s kids. As the Sydney Morning Herald's Jessica Irvine points out, the growth in the so-called taxed-nots is due entirely to the ageing of the population and the ongoing increase in the number of pensioners. Morrison’s "logic", although it is not spelt out, appears to be because pensioners are living longer, they are becoming a drain on the budget. What a sick idea, when people living longer is a threat rather than a joy. In 2013/14, pension payments totalled $39.5 billion. Compare that to the revenue forgone on superannuation of $30 billion, the $5 billion foregone on the capital gains tax discount and the $11 billion claimed as negative gearing rental deductions. All these tax arrangements flow overwhelmingly to the top 10% of income earners. With a properly designed plan, we could recoup the benefits that have been flowing to the top 10% of income earners (about $17 billion for all three tax arrangements) and make the lives of the poorest in Australia – especially pensioners, students, carers, the disabled and so on – much better. Australia has the second highest level of pensioners living below the poverty line of all the OECD countries. Abolishing the current $30 billion in superannuation concessions would give us enough to increase the pension for all those currently receiving it by $12,500 a year. Skewing that increase to those less well off – that is, the 36% of pensioners who live below the poverty line – and tapering the increase for those above, would lift all of those in poverty above the poverty line and, with flow on effects, would provide enough for a much better life for all pensioners. It gets worse. As Jessica Irvine reminds us, while pensioners are badly off, the unemployed receive $131 a week less than a single pensioner. Instead of making life better for pensioners, the unemployed and students, the Turnbull Government wants to cut the payments new welfare recipients receive by around 1.7% a week by removing the carbon tax compensation. This will drive more pensioners, unemployed people and students below the poverty line. Morrison is using the taxed-not argument to justify further cuts to welfare payments and to pressure Labor to support the first tranche of cuts worth $6.5 billion that, according to Turnbull, Labor proposed before the election. The Coalition's hope is that the first tranche will become an avalanche of cuts to the less well off. Morrison hopes that framing the argument in terms of taxed-nots will be more effective spin than Hockey's "lifters and leaners" line and help him and Turnbull win support for attacks on the poor and poorly paid. Let’s not be fooled. The unemployed, the disabled, students and pensioners need our support. Given the rapidly growing inequality in Australia – with 2.5 million Australians living in poverty – the poor, like ordinary wage earners, deserve more income, not less. Bruce Keogh's cartoons are available for sale from Keogh Cartoons. Support independent journalism. Subscribe to IA for just $5 a month (or less).